Look forward to a merrier and brighter Christmas with these 5 outdoor lights that will make your outdoors shine better. Your pathways might not be the Champs Elysees avenue but with the right path lights, it can evoke that charming ambiance like the famous avenue. Make your pathways look more inviting for the casual night stroll with the right path lights lined up to guide you. Usually closer to the ground, bollard lights are knee-length path lights geared towards providing ground lights. If you’re a minimalist, bollard lights are right up your alley with its small stature and less intrusive feature making it blend more easily with your outdoors. If you have a rolling terrain made more accessible with steps, a step light will help you navigate easily. Prevent slips and falls on rainy days or particularly gloomy ones with step lights. Apply a colored film against the light and you’ll have a mini-light show experience waiting at every step. For those with a more expansive property who are looking for an added security, spot and flood lights will give you more visibility and ward off any potential home invasion. Installing it in the right spot can deter any thief from venturing into your property deep in the night. 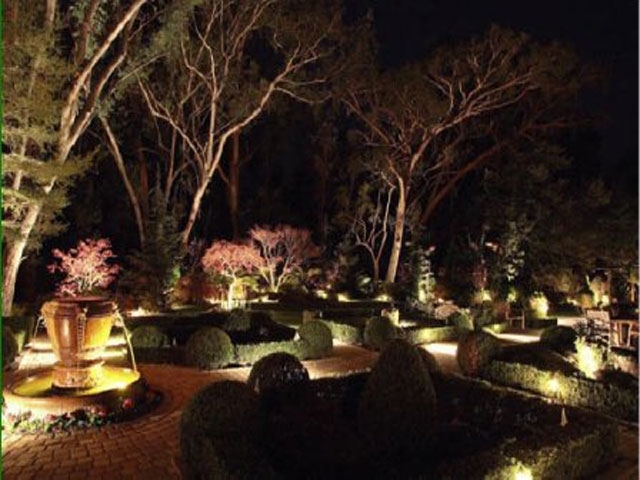 If the spot light is for your dark spots, well lights are customized lights to provide spotlight for your outdoor’s main focal points. Whether you’re having a living Christmas tree or just want to emphasize one of your night-blooming plants, well lights do a great job of it. Whichever kind of outdoor light you need for your home, Personal Touch Landscape can install it for you just in time for a bright and happy holiday season!